Our 2018 Festival production of Gianni Schicchi/Buoso's Ghost is a collaboration with our artistic partner, Baltimore Concert Opera. BCO's concert production debuted this past weekend at the Engineer's Club in Baltimore. (Watch the dress rehearsal video below for a sneak peek.) 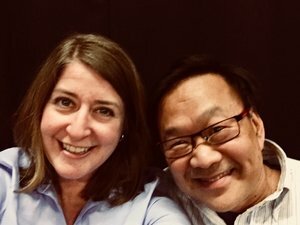 Recently, Buoso's Ghost composer Michael Ching sat down with BCO Executive Director, Julia Cooke, to chat about his extensive opera career plus his ideas about composing and contemporary opera. What drew you into a career as a composer? I wrote my first little opera as a senior project, having not seen more than 3 or 4 operas in the repertoire at that point in time, and the school put that on. Then I got the chance to be in the Houston Opera Studio, and at that point in time the co-director there was Carlisle Floyd. So I got the opportunity to study opera composition with Carlisle Floyd, and the thing about Carlisle Floyd that your audience may know is that he writes his own librettos. And that was of interest to me, since for the college project I’d written my own libretto. That was really invaluable training for me to work with him. It was very difficult, challenging, soul-busting actually. He was very exacting and challenging and I think that was good training. But was difficult. And so, then I went into the opera business after that, rather than becoming a composition professor. I started out as a coach, then chorus master, assistant conductor, music administrator, music director, artistic director, general director, general artistic director… so, I followed that route and so for me, and I think I’ll talk to your audience a little bit about this (in my pre-opera lecture), is that we have this impatient way of looking at talent nowadays that is something that is supposed to be full blown by the time you’re 22 or 23, and I look at it much more like a craftsperson’s development. You do a really long apprenticeship; you are the assistant, then the associate and you really learn how things work before you’re allowed to ‘make the tofu’ or put your name on a piece of furniture. And so, even though I was composing during that period, it was almost like a 25 year apprenticeship to learn the opera field from the inside out, to learn how things work. To learn that in some of Verdi’s early operas, he didn’t write enough scene change music. And as he gets further on, he knows what he’s doing. Even in these late Puccini operas, the ensemble scenes are much better written, they’re much tighter, they’re much easier to perform than the earlier things. Like in [Puccini’s] Madama Butterfly, the exit in act one when the family leaves, it’s just a mess! It never comes off perfectly, it never does, because somebody’s always singing in the wrong spot. [Singing in the wrong spot] is much harder to do in Gianni Schicchi even though there’s a lot of chaos happening in the score. Puccini’s learned at this point in his career how to really make it tight and effective. What I think happens is that the audience or the culture somehow thinks we’re all supposed to become proficient geniuses at 22 or 25 years old. It took Verdi three tries to get it right, it took Wagner three tries to get it right, it took Puccini 3 tries. Carlisle Floyd had a couple pieces he wrote before he wrote Susannah, it takes practice. And so for me, it’s a lifelong commitment to writing, whatever you want to call it -- opera, lyric theater, musical theater -- whatever the heck it is! And the older I get, the more I realize I actually have a gift for language. And the two pieces I’m best known for, Speed Dating Tonight and Buoso’s Ghost, are comedies where I’ve written the words and music. It turns out that as I get more confident about things, it’s not just about being able to write some decent music, it’s being able to write music with the right words, and in my case, generally funny. I mean, funny is a good thing, and comic opera is not as rich of a vein in the opera tradition. I don’t know what it is, we take ourselves so bloody seriously in opera, I don’t know why that is! Somehow we ceded comedy to the musical, and I think that was an unfortunate thing that we’ve done, and so I’m very happy to be known for writing comic opera. It’s not exclusively what I do, but I like comic opera, and I think the older I get, the more I want the words to come through because I want the audience to have that experience. When you expect somebody in their 20s to have something full-blown I just think it’s a very bad system. You have to give people a chance to get things right. And it’s also something of a lazy system for the audience. I think we have this notion of artistic genius that we need to dispense with. I’m sorry, no matter how you slice it, not all Mozart operas are equal. (followed by much laughter) He wrote some operas that may have beautiful music, but they’re boring. I said it! Mozart wrote some boring operas. And rather than put those operas on for the hundred or so people who pretend that they’re not bored, why not put something else on, or put on something that’s older and not been in the repertoire for a while, or put on something new. Audiences need to judge each work not by the name on the label, like the name on my shirt: don’t judge this shirt because it’s a Uniqlo shirt. Judge it on its own. Is it a nice-looking shirt or not? The labels make it too easy, like “we’re going to go hear Mozart, we’re going to hear … whatever it is.” So the audience here is going to have that opportunity to participate in the selection process which is one of the things that you don’t get to do normally if you’re going to see a production of Carmen or Traviata. Then the selection has been made already. Those have the Good Housekeeping Seal of Approval or whatever the heck is the modern equivalent of that. What IS the modern equivalent of that? MC: Right, the thumbs up! The seal of approval for something. With a new work, the audience is given the process, the chance to make that decision on its own. Now, this is not a new, new new work. It was written and premiered in 1996 and it’s been done probably about 15 or 20 times since then, it’s got enough of a track record that it’s out there working and I’m fortunate that there are three productions this year, including this one. So your audience will have a chance to be part of that process, in other words go “Oh, well that was interesting and different!” Or “Oh, that was terrible! I never want to see that particular piece again.” So the audience will be able to be part of that decision making process as opposed to “Oh, we’re supposed to like this because there’s the Mona Lisa and we’re supposed to like it.” Or “There’s the statue of David and we’re supposed to like it. There’s La Traviata and we’re supposed to like it.” The audience doesn’t have to be in that position. They can make a choice! Have you made any changes to Buoso’s Ghost over the 22 years? MC: Well, we just added a spectacular high note for the soprano this morning because she’s got one! She’s got a great high note and we’re going to use it. I think it’s one of the advantages to having the composer around, you can make little changes at the edges and feel like it’s okay to make those changes. In hindsight, my work gets simpler and simpler and easier and easier each year that goes by somehow, and so there are occasional complications that I wish I hadn’t written now. I look at it and wonder “how come I didn’t throw a pitch there - where’s she supposed to pull that pitch from?” Things like that that I wish I had done a little bit more gracefully, or accommodating to the cast. You don’t want to write music that’s so hard that people can’t just completely own it. And I don’t think that’s the issue in this piece, the cast will completely own it, but the quicker they can get to that, the better. How did Buoso’s Ghost come to be? MC: We were shooting the breeze in a hotel in Chicago before joint auditions between Miami and Chautauqua Opera and Opera Memphis, about what happens to opera characters after the opera’s over. And we ended up talking about Gianni Schicchi and wondering what happens next. How did you decide on the story? MC: Well, I just made it up! It’s just one of the things that you do that is so important in opera and theater is just making up stuff, just asking “What next?” My process is I read and I read and I read, in this case about Medieval Florence and Medieval cities, and then I jump in. Do you write your words first? Anything specific about this production that you would like to share? MC: I think it’s a great privilege to be able to conduct your own work, and one of the things that the audience should know is that the person conducting it in 2018 has the same name but is not the same human being who wrote it in 1996. For example, this morning, Kirk [the tenor singing Rinuccio] asked me about a line in the piano vocal score “What instrument is playing that?” and I had to say “ I don’t remember -- I have to look at the orchestra score!” And so even though it’s kind of a cool thing to have a composer conducting his own work, I have to come back to the work and study it kind of like anybody else. Do you have favorite composers, anyone you emulate in your personal style? MC: I love Puccini, so we can start off by talking about that. Puccini and Bizet are favorite composers for me. I happen to love Rossini’s comedies a great deal as well. My feeling about contemporary opera is that most contemporary opera is too sophisticated for its own good, and that opera ought to cut itself down a peg in terms of its seriousness. I think composers should write things that are accessible and melodic and make people laugh and cry, and they can certainly do it through whatever subject matter they want to. We can have social messages, and it’s important for us to have them, Lord knows, but we still need to tell an entertaining story. I think people get a little bit too bound up in the sophistication. It’s like having a box of 128 crayons, and you really only need 12 or 24 crayons to make a nice picture, and then sometimes when you get the 128 crayons, it’s like “Oh my God, which color?” You have too many decisions all of a sudden. If we can keep it simple, tell stories that are accessible, that make people laugh and cry, and maybe even think a little at the end, that’s really what we ought to be doing. I want my audience to be entertained first. To be challenged, I don’t know, maybe we ought to go see a play! In opera, there’s plenty going on, it’s pretty complicated, and if you really want to be challenged by subject matter, pure language, read a novel, read a philosophy text, go see a play! I think opera collapses under the weight of too many tools. In the system [of training to be a composer], opera composers are trying to put their all into these operas, and they need time to figure it out. The way to figure it out is the dedication of a company to keep working with them. I’ve had things fail, and you learn from that! Anyway, it’s fun to be here to conduct Buoso. I’ve actually conducted Schicchi more than I have Buoso, and it’s exciting to be able to conduct Buoso again, and work with a group that’s so clearly well chosen and well prepared. And I’m looking forward to the chance to show it off. Buoso works through a lot of stylistic borrowing and quotation -- you’ve got to have your musical thesaurus there to get the “in jokes” because there are quotations that are not just from Gianni Schicchi -- there are quotations from Madama Butterfly, there is a quotation from Ponchielli’s La Gioconda, and those are just there to keep me amused and for the sophisticates to go “I know that!” You don’t need to know those things but they are there. But there are other things that everyone will certainly get. There are allusions to gospel singing and Stephen Sondheim, and things like that and the audience will get those, either on a conscious or subconscious level. But it’s really all in the service of the characterization and story telling of this devious family, and how this smart newcomer to Florence, Gianni Schicchi, outwits them in the end. And he gets it all!